After winning a video contest a few months ago through Mentor Foundation USA that was covered on the Ballston Journal, I was finally on my way to Los Angeles as part of the first place prize. The foundation exists to help prevent drug usage within youth and to help them realize their full potential. 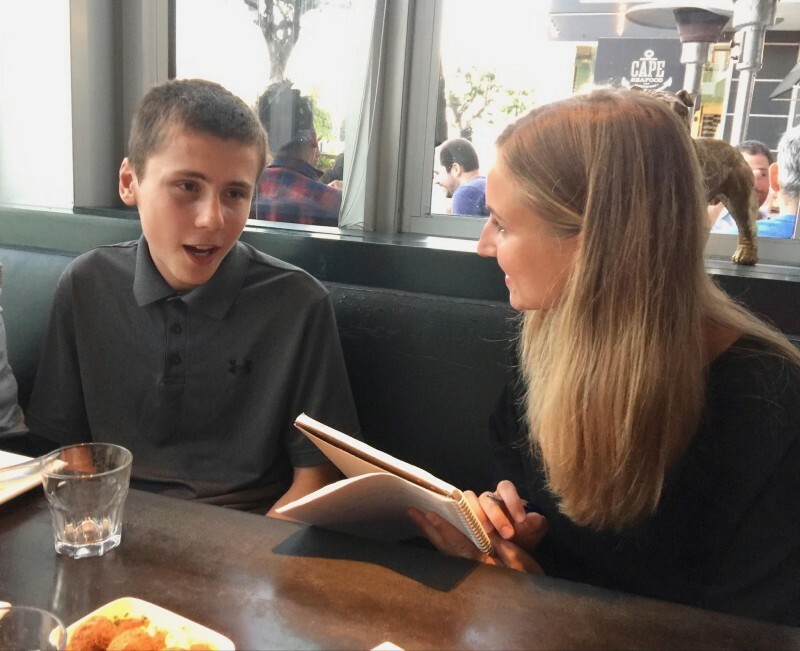 The contest was called “Living The Example,” and its aim was to find teens that are doing just that. 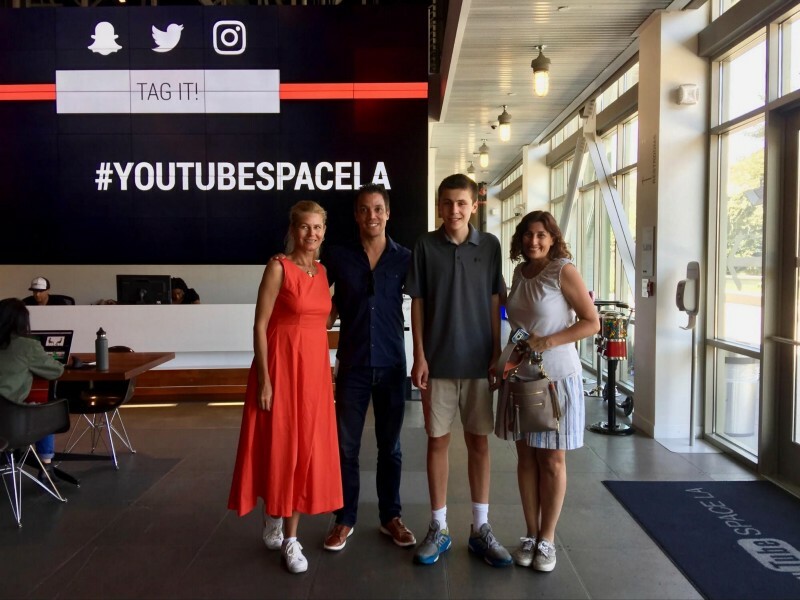 I was stoked to find out we would visit the Google offices in Venice Beach and the YouTube Space and offices in La Playa. I love Google; it’s a part of everyone’s lives today. I feel like I say the word “google” as a verb in every other sentence. Gudrun Giddings, the CEO at G4C Innovation where she also writes and produces films, and the president of the Swedish American Chamber of Commerce in Los Angeles, met us at our hotel to drive and go on the tour with us. She is a very nice person and happens to be a board member for Mentor Foundation USA. 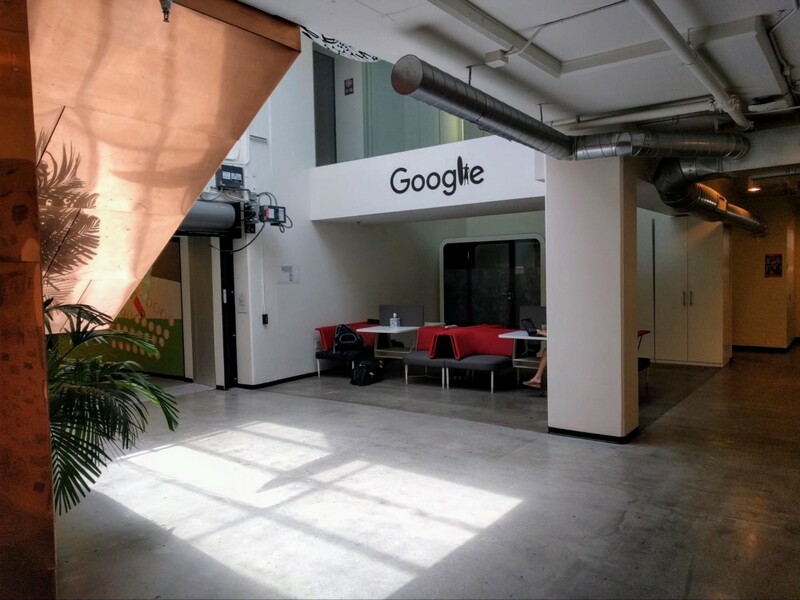 She was just as excited to visit the offices as we were, and as an executive and head of a Hollywood film company was interested to see how Google operated. 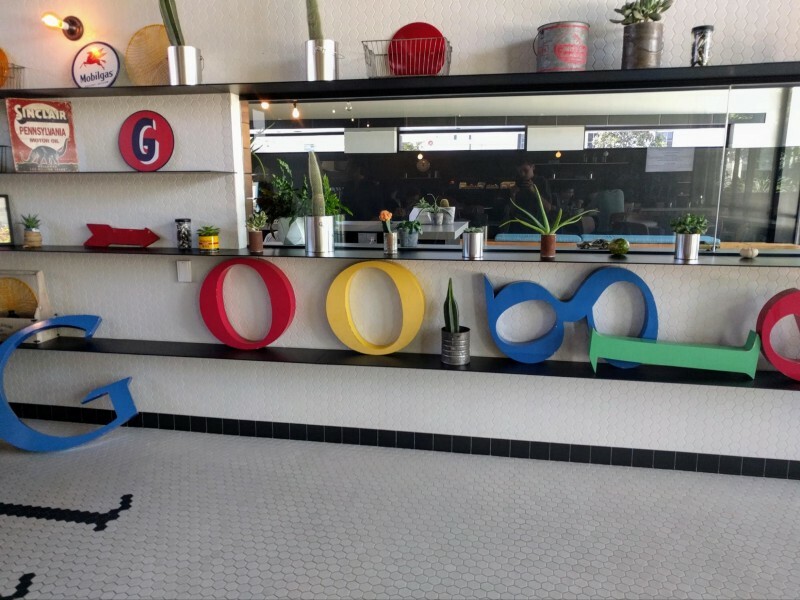 Our first stop is Google in Venice Beach. When we walked up to the building, you could instantly feel the ‘tech’ vibe. 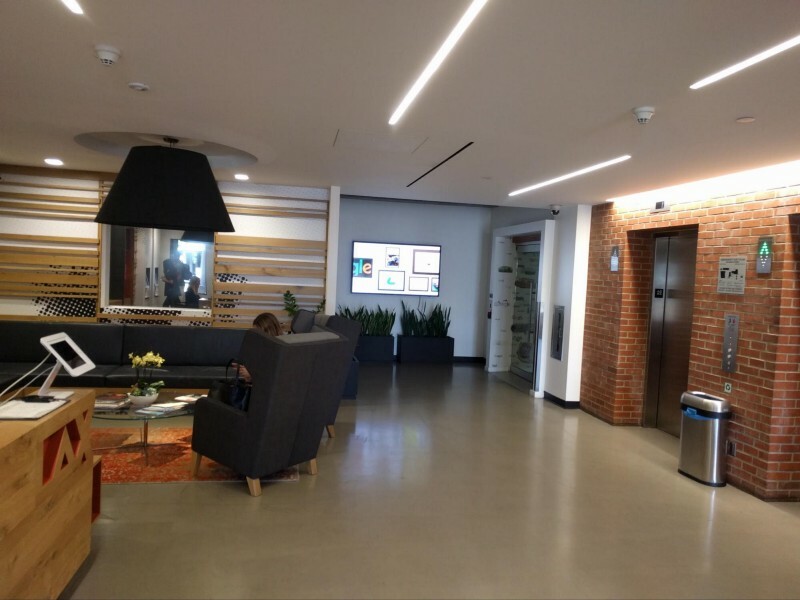 Huge glass doors, plants everywhere, exposed brick and TVs flashing the Google logo. Each of us needed to sign in on an automated kiosk with our name, person from Google we were meeting with, and the reason of our visit. The entire process was very efficient and fast, but I would expect nothing less of Google. We met up with Marc Powell, a staff member for Google. His primary job is to work with studios and producers to bring content to Google’s platforms, such as Google Play and YouTube. We then walked through the locked doors that you can only go through unless you’re with an employee. 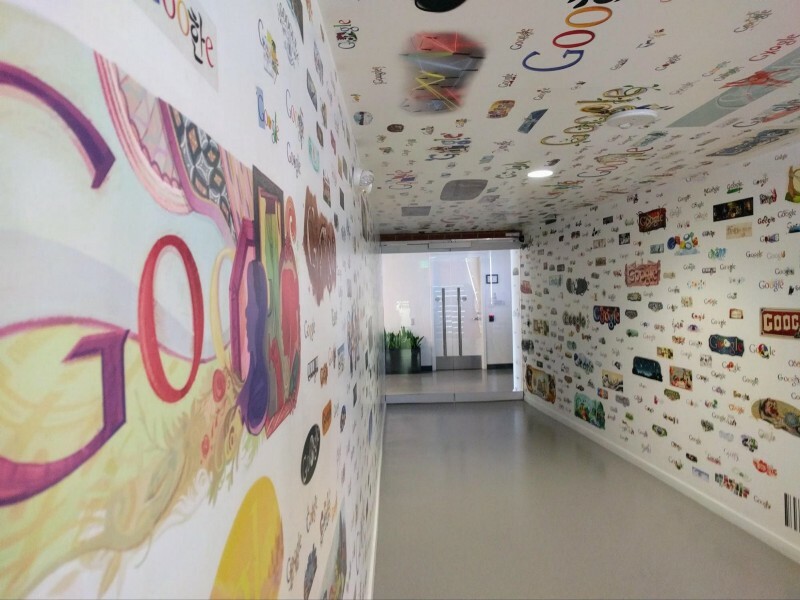 We were greeted with a hallway with walls and the ceiling printed with a collage of Google Doodles, the themed logos that are sometimes on Google’s homepage. Next, we take a left into the cafeteria. 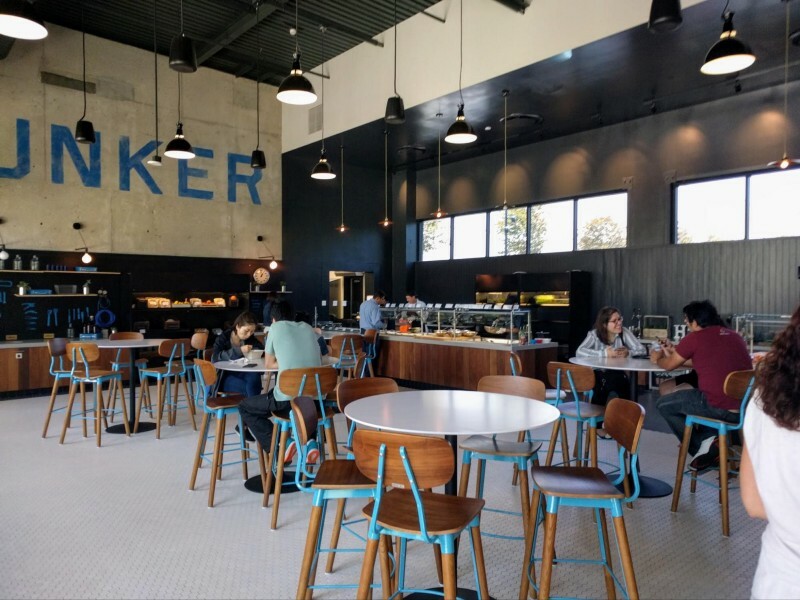 Google’s dining room is very unique, in that it serves breakfast, lunch and dinner for all of their employees for free. Everything is free, even the in-house Starbucks. Meals are designed to be insanely healthy. I didn’t see a single employee eating a lunch from home or from another restaurant, why would they want to? There are four main parts of the room: a salad bar, the buffet line with featured dishes, a frozen yogurt machine, and a counter of drinks. 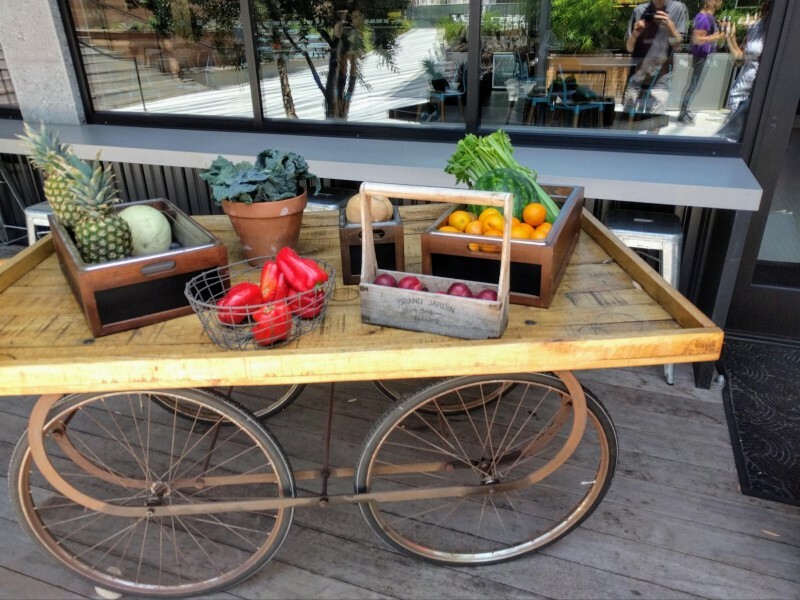 Google is trying to get their employees to eat healthier by hiding junk food like food with fat and high calories in non-visible drawers. Instead, the healthier options are out for display. It works, and in their research healthier foods were chosen in favor of most of the time. While I was loading up my plate I noticed something interesting, there were signs posted to almost every food item saying to only take what you can handle to waste less food. It really stuck with me and I think I took less than what I would have without the sign. Why does my thumb look so weird in this picture?? Going to sit down with the group of people I was with, I saw that the seating of the room was neat. Tables were arranged all differently and you could find a place you’d like to sit. The room wasn’t bland like a regular office break room might look like. Instead it was colorful and bright, and if I worked here I’d actually enjoy it. 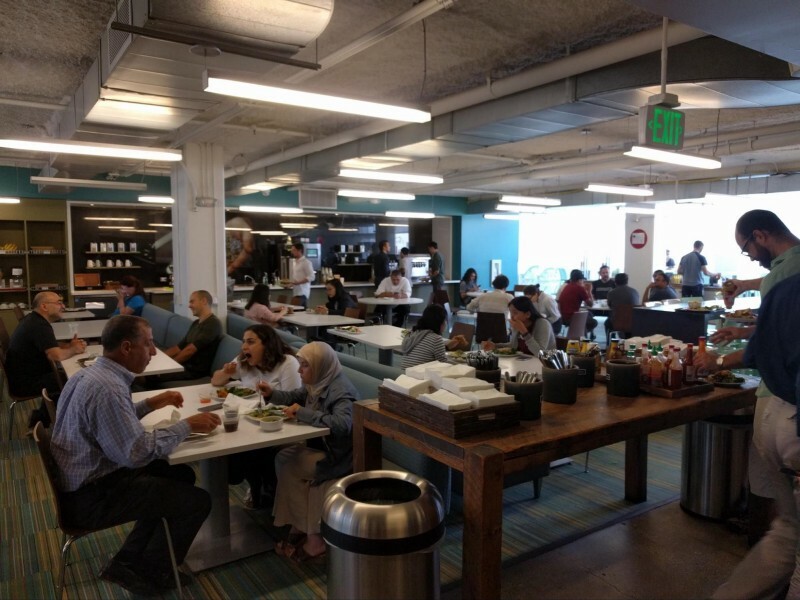 While talking over lunch, I found out some of the many perks of being a Google employee. You can bring your dog to work (no cats), they’ll do your laundry, free meals, free haircuts, free electronics as long as it’s for work, a doctor on site, and the most important I thought was flexible seating. You can work anywhere on the campus for creativity and inspiration. 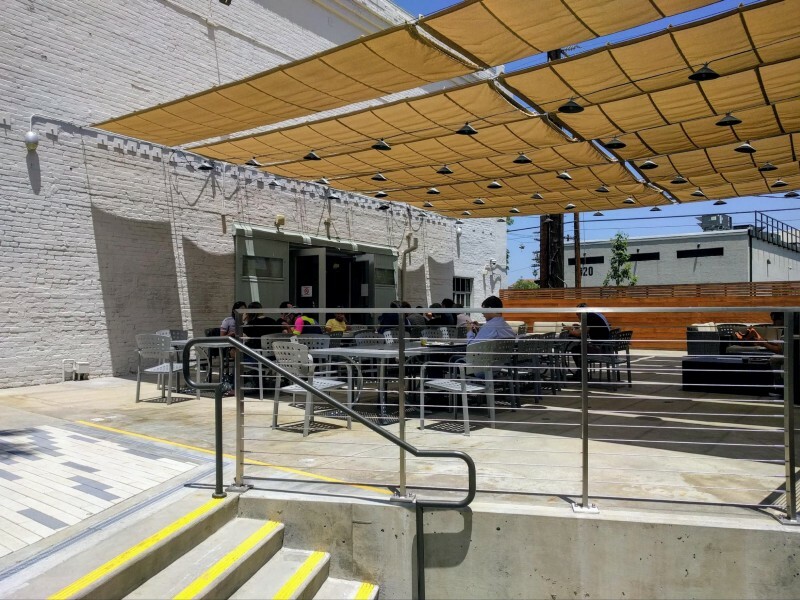 While everyone still has their own desk or dedicated work-space, you can go outside to patio tables, inside a big open room, or a picnic table out back. During lunch, Marc said that he’s never felt healthier. He said that during his first couple of weeks at Google he gained some weight due to the endless supply of food, but over time grew accustomed to it. Now he says he’s never eaten more vegetables in his life. He added that some people that got jobs here straight from college (and therefore know nothing else) will complain when they get pasta two days in a row, but he doesn’t take any of it for granted. Before we left the cafeteria, we each grabbed some frozen yogurt while Gudrun ran to get Starbucks down the hallway. Bringing your dirty dishes is even an efficient process at Google, there is a spinning wall with empty trays in the corner of the cafeteria. Just set your plate on one of the trays and it’s whisked away to be cleaned. 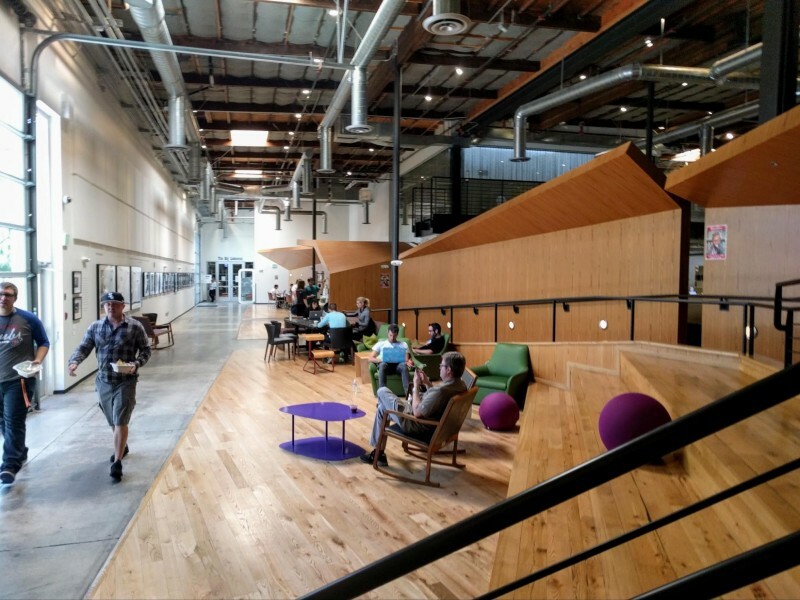 Next, we enter a large, airy and open room with flexible seating and large windows. The Starbucks is to the right, and you can see colorful murals through the windows outside. We continue right at the end of the room and enter an office. Everyone is deep into their work. 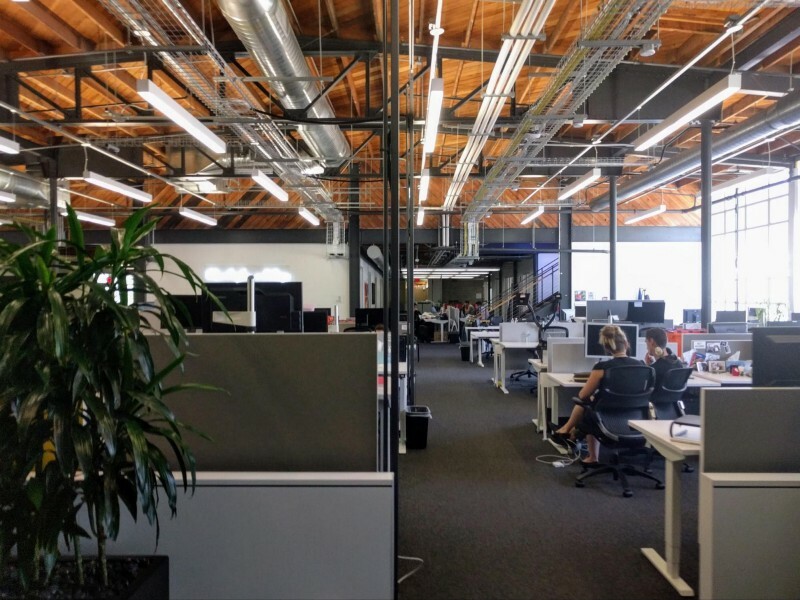 Although there are cubicles, they aren’t the kinds that have high walls and no one is completely isolated, allowing for a more collaborative workspace. Something caught my eye: is that a liquor cabinet? When I ask Marc, he says that it is alcohol, but shrugged it off as no big deal. No one gets wasted, I guess. Continuing through the room, we get to a door to go outside. There is a large awning with bikes underneath. 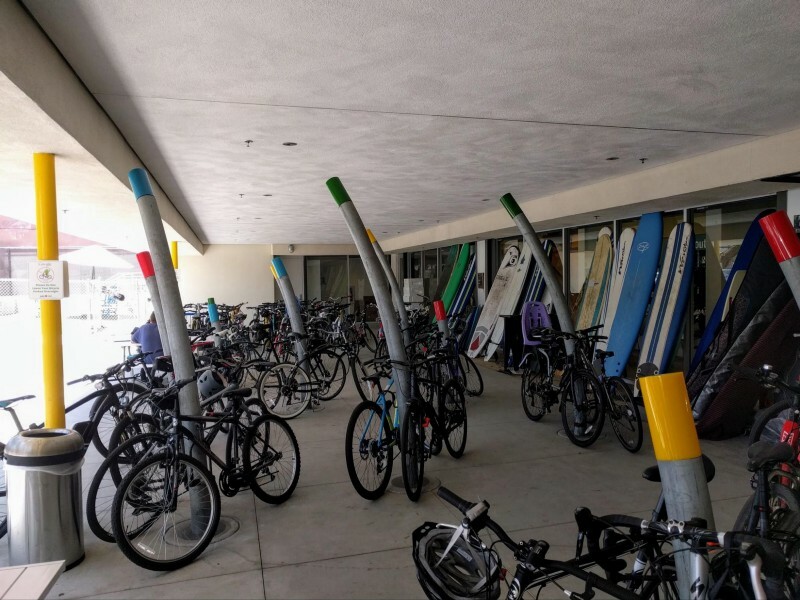 Most of which are ones people rode from home, but others are Google owned that anyone can use. We were near the Santa Monica bike trail, where cycling is insanely popular, but it was still quite impressive that this many people used bikes. In the picture, you can even see surfboards. 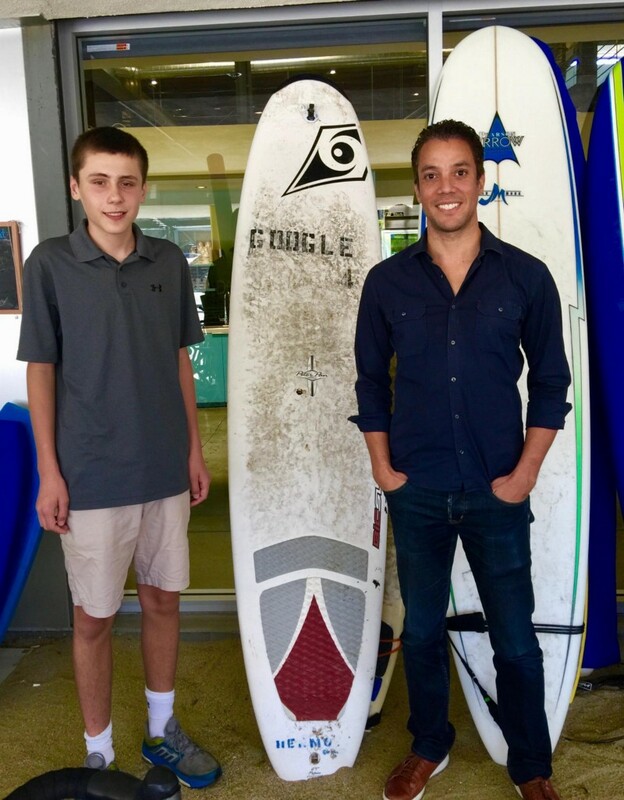 Because we are only a few blocks from the ocean, Google encourages their employees to surf during a break. One has the word “GOOGLE” on it. 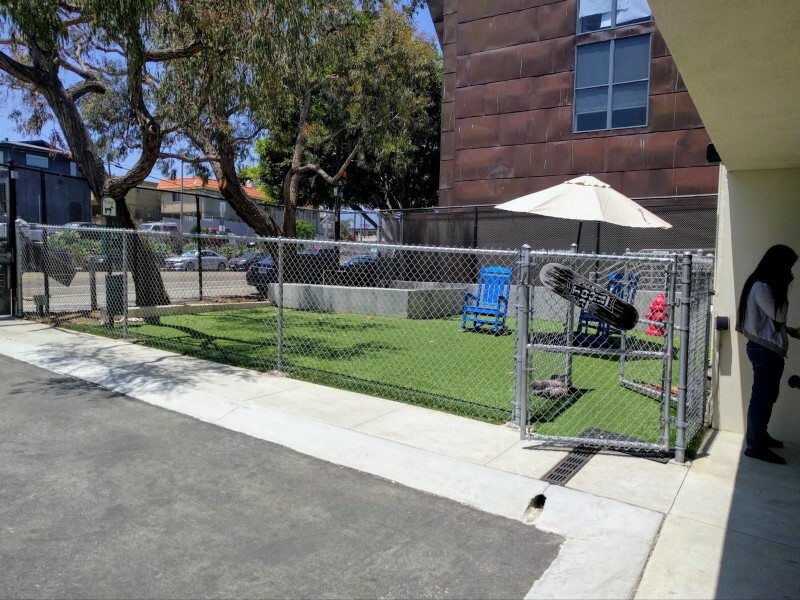 To the right, further from the bikes, is a fenced in mini-yard. Marc tells us that it’s a dog park for the pets in the office, much to my mom and Gudrun’s surprise. To the left, we see a retro camper, the kind that you can attach to a car. Marc tells us that it’s just another place for flexible seating. 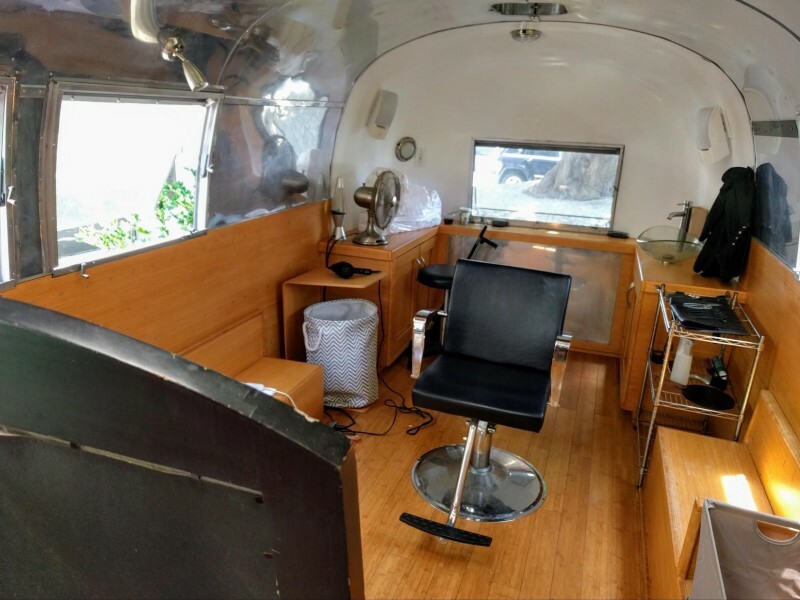 I look inside and it appears to be a barbershop. When I tell him, he’s surprised, he didn’t know all the benefits he has at Google! We go back inside through the office space and cafeteria to the street outside. We cross Hampton Drive and see a tall gate. 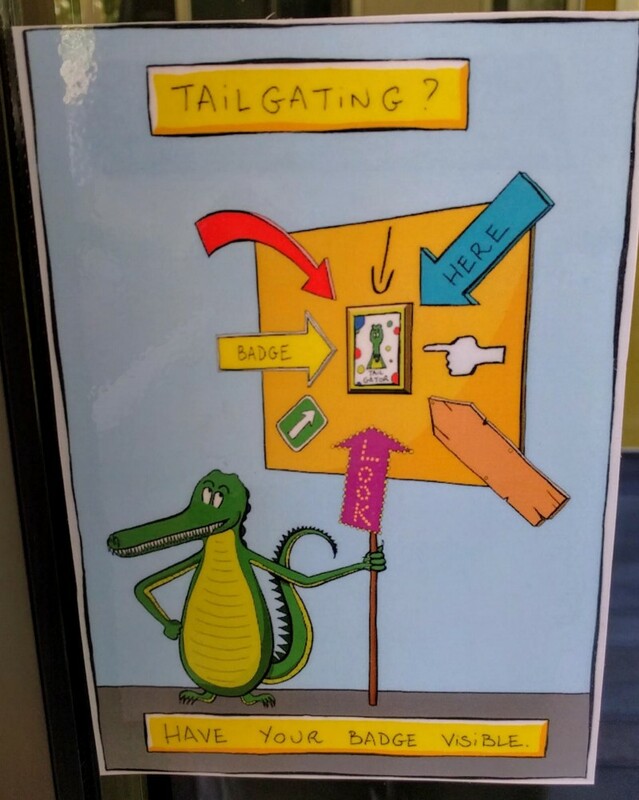 A running joke at Google is the “tailgator.” Google employees are reminded to see if other people entering buildings with them also have badges, otherwise, they could be a “tailgator”. This is depicted in different cartoons on doors in Google with an alligator, hence the name. There is a ton of seating where people are eating their lunch and working away on their laptops. One guy has his dog sitting next to him. It almost feels like outdoor seating at a big restaurant. We keep walking to a juice bar. Outside is a wheelbarrow full of vegetables, which I thought was funny because there were actual fresh fruits and vegetables inside that anyone could take. 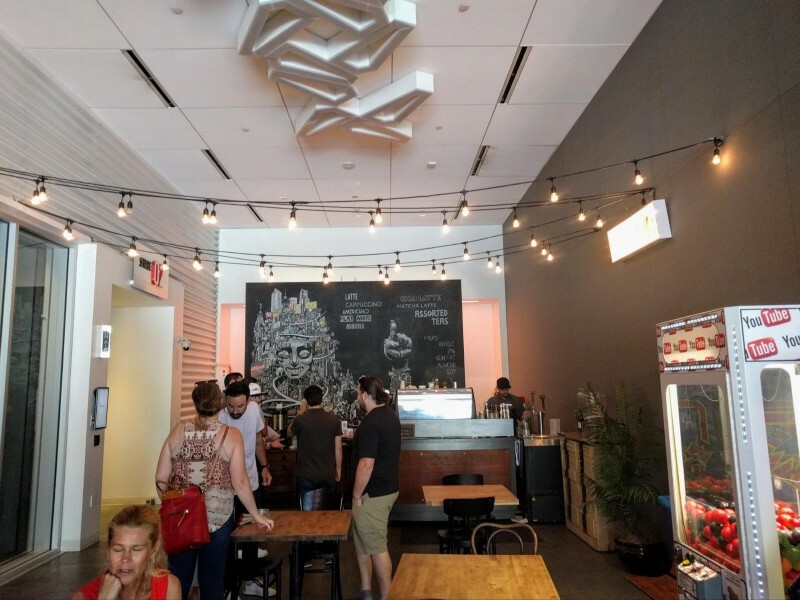 Inside the juice bar, there are again people working inside, talking and collaborating. There are already made smoothies ready to take, and everyone grabs one. 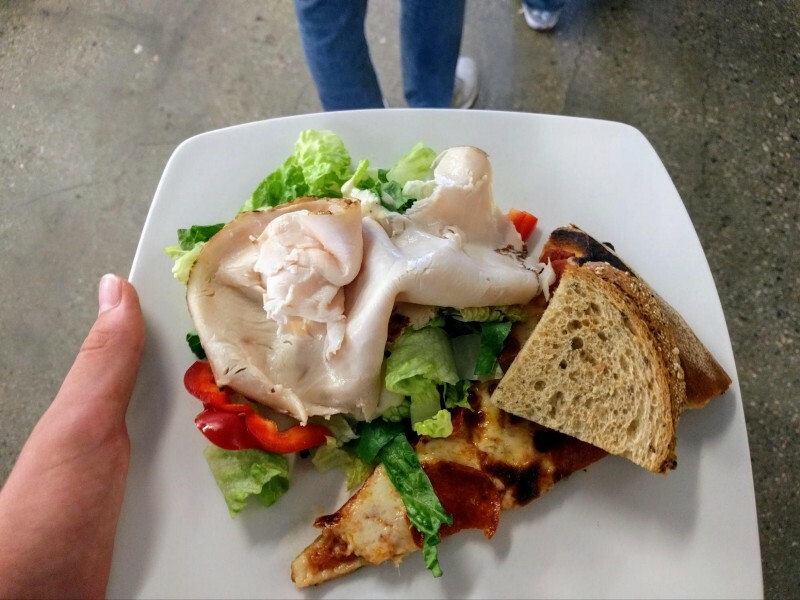 There’s also a plate of vitamins and minerals, I guess Google employees are encouraged to take supplements. Marc takes a few, acting like it’s completely normal. 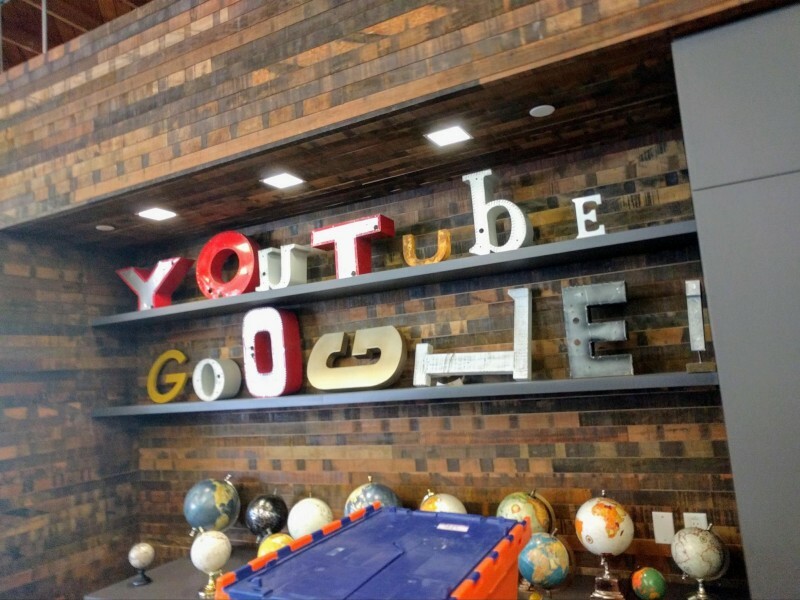 We’re done with Google in Venice Beach and next head to the car to drive to YouTube’s offices and studio in La Playa, only a twenty minute drive. After some confusion with road closures and the traffic situation, we arrive. Again, I can see many doors each with their own “tailgator” sticker. Inside, the offices are set up similarly. Very open and airy with a lot of work-space. We only spent a few minutes in the offices, as this was just a way to get to the YouTube Space. 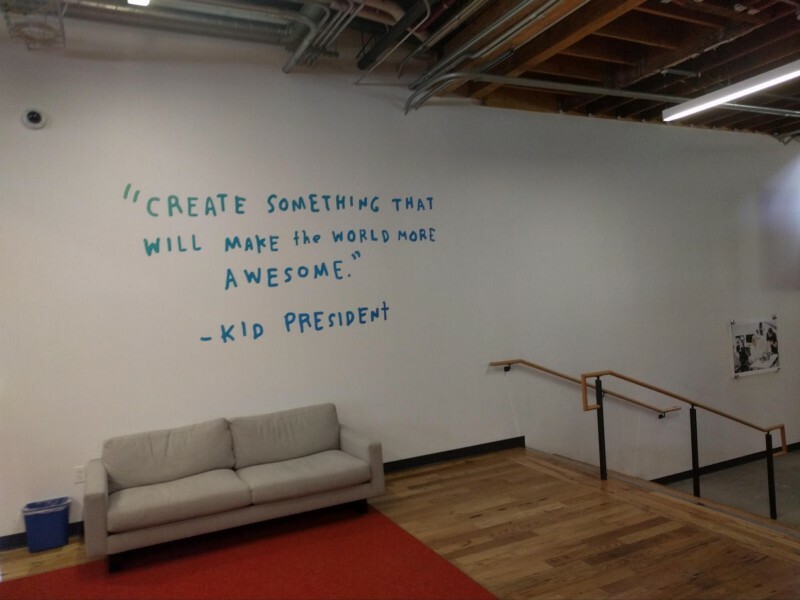 Even a quote from a popular YouTuber is plastered on the wall. We go outside and start walking to the YouTube Space, which is a studio owned by Google where people with popular YouTube channels can come to learn, film using incredibly expensive equipment, and edit their videos on very powerful computers, all for free. There are nine locations with three being in the US, while the one is Los Angeles in the flagship one. So, why would Google do it? It certainly isn’t cheap to operate multiple studios around the world with professional equipment. The benefit to Google and YouTube is that when content producers use their studio, they have to premiere that content onto YouTube’s platforms, in turn attracting more visitors to their website and more money from advertising. 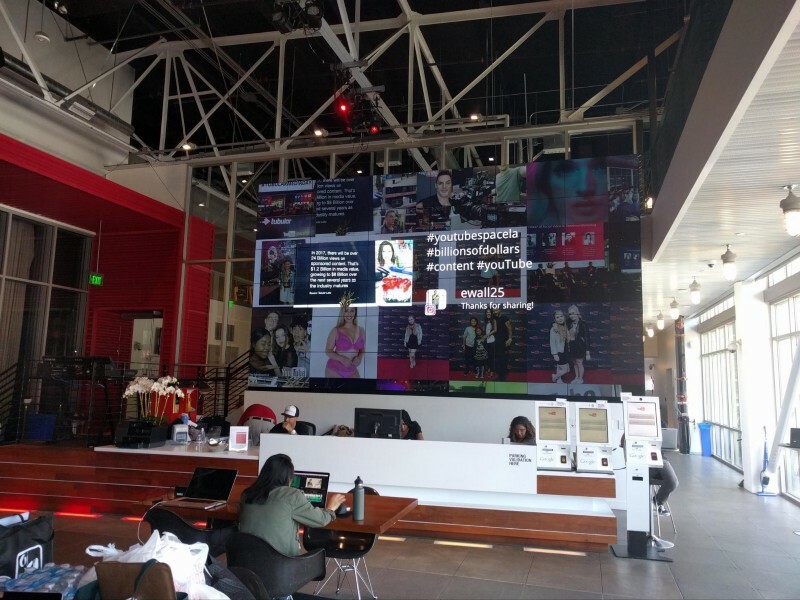 When walking in, my first impressions were the big TV with pictures from social media about the studios, the high ceilings and large windows. Again, there’s a free Starbucks and an arcade machine in the corner. The tour starts and the representative from YouTube shows us a table listing what benefits you get compared to how many subscribers you have. To shoot at all in the Space, you need at least 10,000 subscribers, and that will get you one day of shooting and three days of editing. It goes all the way up to 1,000,000 subscribers where you’ll get six days of filming and nine days of editing. He explained that even if you qualify to use the studios, you still need to reserve a stage or editing space online. Next to every stage, there is a monitor showing exactly what channel should be shooting now and what time they have that stage until. 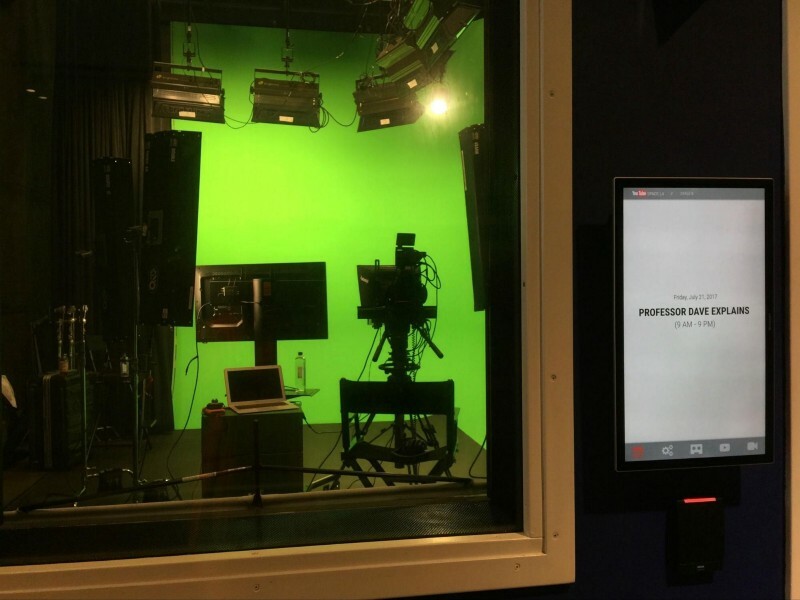 In the picture above, we saw that Professor Dave Explains was set to film in that studio, which is reserved exclusively for people with 10,000 to 100,000 subscribers. There was one other green screen studio and one white screen studio. Overall, the visit to both Google and YouTube was a success. Our last stop of the day was The Fat Dog, a Swedish-owned restaurant in West Hollywood. While there I also met Emil Abedian and Caroline Stromberg, both of SACC-LA. The food was awesome and was a great way to end the day. A special thank you to everyone who made this trip possible: Gudrun Giddings, Marc Powell, Michaela Pratt, Stacey Walz, Emil Abedian, Caroline Stromberg and the Swedish American Chamber of Commerce in Los Angeles.